This past week was jam packed with fun events including a stop in Baton Rouge, LA! We had met a chef named Jay Ducote back in November when we attended the World Food Championships in Orange Beach, AL. Jay is a Food Network star (he appeared on Chopped) and hosts his own radio show! He had always told us that if we were ever in Baton Rouge we should stop by his restaurant named Government Taco! 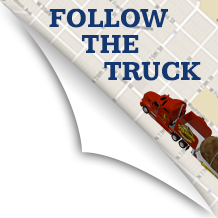 We took him up on his offer and even parked the truck at White Start Market where his restaurant is located. Jay was so excited that we were coming that he decided to even add a special item to his menu for the day- totchos (a mix between tater tots and nachos). He used the Grown in Idaho® brand’s potato puffs and loaded it up with yummy nacho toppings. We also did a fun “totcho throwdown” video where the tater team got to taste totchos from Government Taco and another restaurant in the market named Yum Chow Phat. I have to say they are my new favorite food! Click here to see the Facebook live. Thanks again to Jay for having us! 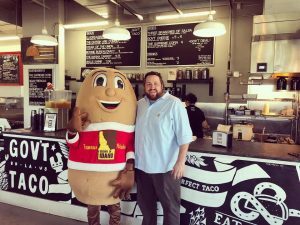 Jay Ducote and Spuddy at Government Taco! Natchez, MS was our next destination for a 50th anniversary celebration at Natchez Market! The Market is family-owned and has over six different locations in Mississippi and Louisiana. The event was also a fundraiser for the StewPot, a local food kitchen. At the event there was a steak cook-out, 95.5 Country radio station, and we had a signature board. 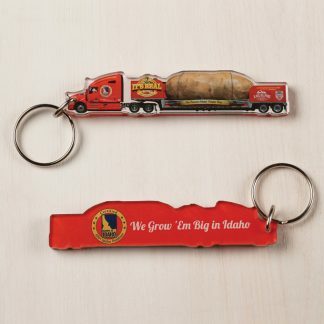 The store also had an Idaho® Potato sale and a scavenger hunt for the kids with prizes. The folks at Natchez market really blew our socks off with this event, and there were visitors non-stop! 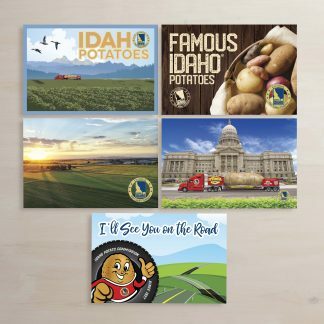 They were SO nice and even donated eleven 70-count boxes of Idaho® Potatoes to us for an upcoming event. We can’t thank them enough for their generosity and for being so welcoming. The folks from Natchez Market and Tater Twin Jess with the signature board for the Stewpot! The next day we were off to little Lufkin, TX to a restaurant known for the best baked potatoes in town called The Spud Too. The Spud Too has 20+ that they serve baked Idaho® Potatoes with different combinations and toppings including Taco Meat, Chili, BBQ Chicken, Veggies, and many others! Let’s just say it was heaven on earth! During our visit, the restaurant had free samples, a raffle to win prizes, and games. We also got to tour inside the restaurant and see the whole process from the owner Ricky! It was spud-tacular! 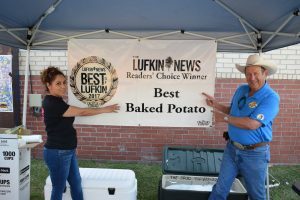 The Spud Too is known for the best baked potato in Lufkin! 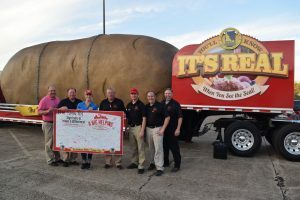 The tremendous tater headed to Houston, TX afterward for the 31st annual McDonald’s Houston Children’s Festival. The festival benefits Child Advocates and over the years has raised more than $5.4 million dollars to help children who have suffered from child abuse. It also attracts over 60,000 children and their families every year. Located in the streets of downtown Houston, there are 200+ activities including small carnival rides, live performances, games, and more. We had Idaho® Potato decorating at our booth which is always a big hit. We were also parked next to the McDonald’s truck again and they were giving out free fries all weekend long! It was so fun getting to interact with all of the kids, and Spuddy Buddy made multiple appearances as well. It was our third year at the festival, and was another success! It’s also nice to see familiar faces so thank you to Kelly and Tony from MHCF and everyone from Child Advocates. 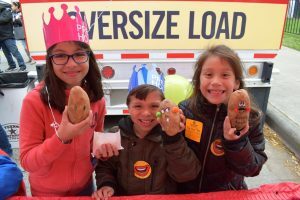 Children decorating Idaho® Potatoes at the McDonald’s Houston Children’s Festival! 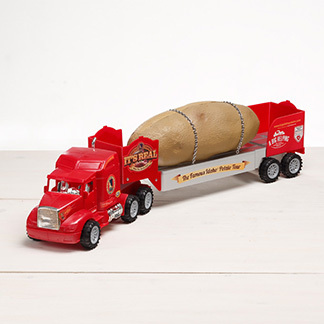 You never know where you will see this #spud next! Headed to Bristol, TN next.. check out our tour schedule at bigidahopotato.com! Until next time my potato people!